In film, there are two primary approaches to narration: the well-structured story arc from Hollywood films and the ambiguity of art cinema. Ever since the release of Grand Theft Auto III, open world games have largely relied on the former. From Read Dead Redemption to The Witcher III, the journeys of protagonists in open world video games are depicted with clear arcs. The characters are well-defined, and the player understands their motivations. Breath of the Wild (BotW) forges a different path, offering a narrative that’s built around ambiguity and that embodies many of the traditions of art cinema. 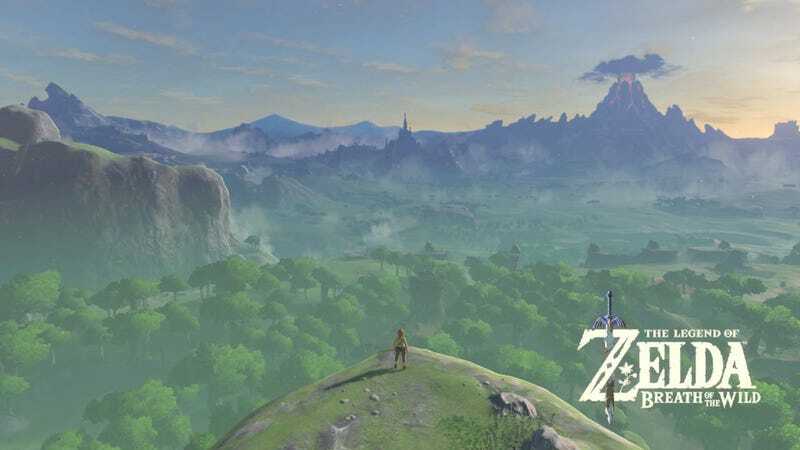 By tracing the narrative choices in BotW - focusing on story structure, Character development, and cinematics and conversations - I hope to reveal the extent to which the game departs from open world game conventions and functions as a work of art. In general, open world games have story arcs that can be subdivided into what are referred to as story beats - a series of moments used by screenwriters since the 1930’s to structure narratives in an easily digestible way. These beats directly chart the progression of the protagonists’ journeys and are driven by cause and effect. The narrative in Breath of the Wild begins in a familiar way. The player gets a very clear mission - defeat Calamity Ganon - with a side of exposition that broadly sketches the stakes of the battle to come. After this opening section, however, the game opens up and allows the player to do whatever they like. This freedom of choice results in several divergent story structures depending on whether the player rushes straight to fight Calamity Ganon, opts for some unstructured exploration, or favors playing within the framework of a main quest line. Even for those who choose the more structured approach to BotW, there is not a story arc subdivided into beats like Hollywood films. In the time between the opening section and the final battle, there’s no midpoint or “dark night of the soul” in which Link debates whether he is capable of defeating Ganon. He just continues along with his activities that range from the mundane (collecting korok seeds) to the extraordinary (conquering Divine Beasts) without clear causal relationships connecting these events. This narrative fluidity is unique to BotW and allows for countless ways players may experience the story. Like the characters in studio films, those in open world games are well defined. The player understands their motivations, their inner psychology, and their relationships with others. In Grand Theft Auto V, the player quickly learns that the primary goals of Michael de Santa and crew are money and self-preservvation. All decisions in the game, however ludicrous, can easily be traced to these motivations. By contrast, BotW never reveals the inner psychology of Link. Like The Blind Swordsman Zatoichi or There Will Be Blood, the player is given small pieces of character information and must decide how to interpret them. In the beginning of the game, it is established that Link was the guardian charged with protecting Princess Zelda. However, the relationship is not developed any further. They could be just friends or maybe lovers. Link could be completely indifferent to Zelda and is instead driven by a sense of duty. Such interpretations are possible because the game allows players to develop their own conclusions regarding characters. Another example of this approach can be found in the quest to conquer Divine Beast Vah Rota. Prior to the battle, we learn that the former Guardian of the Divine Beast, Milpha, was in love with Link. As Link progresses through the quest, the evidence of her love builds yet not details about how Link feels are ever given. As a result, the player may decide Link’s feelings - be they romantic, platonic, or something else - without being contradicted by the game. This approach is unique in open world games and narrative video games more broadly. This may be the game’s strongest connection to the traditions of art cinema. The narratives in most open world games are driven by cinematics and conversations. During these sequences, the player has little to no input on the outcome, since they feature pre-recorded voice over or written dialogue. In some games, like Witcher III, the player may be confronted with dialogue trees that can change which version of the sequence unfolds, but there are ultimately just a handful of pre-determined outcomes. Now this guy has a clearly defined voice and tone. BotW also features cinematics and conversations that move the story forward, but with several traits that leave room for ambiguity. The most impactful element is Link’s silence throughout the game. The player never sees his words or hears his voice in at any point in the game. While there is a degree of non-verbal communication, it is not enough to close the door on multiple interpretations of how Link may be interacting with the other characters in the game. This is built on a trope of the Zelda series that feels like a much more thoughtful design decision than it has in the more linear entries in the series (i.e. Skyward Sword). Since the central story can be experienced in so many ways, the cinematics can’t be ordered in a way that drives the story in one single direction. Thus, every cinematic and conversation in the game largely works without any additional context. The player may interpret the cinematics differently with the context of other cinematics, but it is not required. This brings a slice of life quality to the narrative that is more similar to The Bicycle Thieves than the linearity of Arkham Knight. After defeating Ganon, Zelda and link stand alone on the fields of Hyrule. “Do you really remember me?” she asks. Breath of the Wild doesn’t answer this question, leaving the interpretation of this line and Link’s response completely up to the player. This moment perfectly encapsulates the narrative approach of Breath of the Wild, a game that embraces the conventions of art cinema over those of Hollywood films. The fluid structure, character development, and unique take on cinematics and conversations in BotW work together to create a level of ambiguity that is uncommon in the open world game genre. Breath of the Wild draws significantly from art cinema, yet there are many places where video games are still not considered art themselves. History has proven that an exclusive definition of art will inevitably be revised, just as it was to include film decades ago. It is therefore important for those who recognize video games as art to continue building the case for those who are not yet convinced. When we use the same, relevant terms to discuss games, such as narrative or genre, and carefully examine the emotional effect of various elements, we further establish video games as a medium for artistic expression that should be given the same attention as other mediums already considered as forms of art. For this analysis, open world games refers exclusively to a genre of games characterized by an open world in which the player selectively chooses activities in the order of their choosing. The experience isn’t broken up into discrete levels, like the LEGO games that have a hub world. Some MMOs may fall into this category, but open world survival games, which offer little in terms of narrative, do not. Art Cinema is the term for films made for artistic expression rather than commercial gain, most often produced independently. They feature stories that raise many questions and don’t necessarily answer them explicitly. The stories can be structured around beats, but much is left up to the interpretation of the viewer. This trait is what is referred to as “ambiguity.” Some well-known examples of art cinema are Citizen Kane, A Clockwork Orange, and There Will Be Blood.